Joseph Sulaitis was born June 20, 1921 in Hoboken and grew up in Jersey City. He attended Dickinson High School, where his muscular 6’2” frame and ability to throw and catch a football made him a star. After graduating, Joe played semipro ball and got a job instead of attending college. 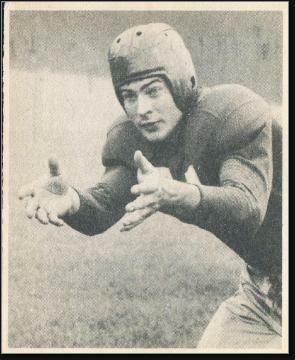 He set his sights on an NFL career in the early 1940s. In 1943, the NFL reduced roster sizes from 30 to 28. Even so, most teams had to beat the bushes for competent pros. Many teams, including the New York Giants actually brought players back from long retirements. For Joe, it was a golden opportunity. He earned a tryout at the Giants’ camp at Bear Mountain and made the team as a do-it-all reserve on the line and in the backfield. His murderous blocking was sorely needed, and over the years he would further refine his technique to become one of the best in the business. The Giants actually had several runners during this era who had little or no college varsity experience. New York won the East on Joe’s rookie year and repeated as East champs in 1944. In 1945, Joe cracked the starting lineup, but the team’s record fell to 3–6–1. The 1946 season found the NFL in competition with a new league, the All America Football Conference. The AAFC stocked their teams with returning war veterans and established pros when they could. Joe signed a deal with the Boston Yanks but was nagged by injuries all year and saw action in only three games. He returned to the Giants in 1947 and reclaimed his starting job. He also played quarterback and defensive back. In a November game against the Eagles, Joe had an epic head-on collision with running back Steve Van Buren and had to be helped off the field. He was back in the lineup a week later. 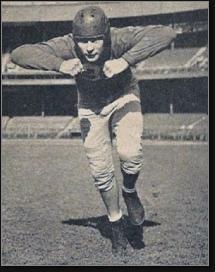 In 1948, Charlie Conerly joined the Giants and the team switched to a T-formation. As a solid blocker and pass-catcher, Joe was an important part of the new backfield. He cleared the way for teammates Joe Scott and Choo-Choo Roberts and snared a career-high 26 passes for 298 yards. Joe played five more years for New York, providing veteran leadership and plugging holes for coach Steve Owen. With 10 under his belt with the Giants, Joe ranked as the second longest-serving Giant behind Mel Hein when he retired. Joe worked for the Giants as an assistant and scout after his NFL days. He passed away in 1980 at the age of 58 after a heart attack.